adventure often, take care, and do good. Katie Boué is a Cuban-American outdoor advocate, freelance writer + social media expert, professional adventurer, climber, public speaker, former van-dweller, and public lands wonk. She is Miami-raised and traded flat Florida swamps for a life of exploring mountains, camping in the desert and playing in the snow. Boué currently lives in Salt Lake City, UT with her partner Brody Leven and her dog named Spaghetti. Katie’s love of being outside and sharing wild spaces is the focus of her work in the outdoor recreation industry. 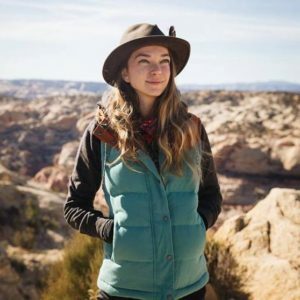 She sees opportunity for empowerment, empathy and action in every outdoorist–and she wants to help the outdoor community do good, from public lands policy + sustainability, to better access + inclusion in our parks and in the media. Speaker and workshop host at outdoor events, retreats and conferences. See more speaking engagements and advocacy work here. Featured in and written for publications including The Denver Post, Matador Network, Backpacker Magazine, Elevation Outdoors, REI Co-op Journal, and more. Social media + community advocacy manager for the Outdoor Industry Association. Read my past writing for OIA here. See all the videos I’ve appeared in here. I welcome sustainable + conscious brands, organizations, and media as sponsors or affiliates. If you would like to work together, please feel free to reach out to coordinate and inquire about pricing for content services. From sponsorships and social marketing strategy to media trips around the world, I’ve worked with outdoor organizations like REI, the American Alpine Club, Visit Florida, Outdoor Industry Association, Columbia Sportswear, Cotopaxi, Nature Valley, Honda, Teva, Goal Zero, Microsoft, Oru Kayak, Sierra Trading Post, and more. Need help with social media or blogging? I offer social media audits and management, coaching for novice bloggers and adventurers looking to break into the outdoor advocacy, creative media, brand development through social media, and discovering what it takes to make it in the outdoor and travel industries. If you’d like to get in touch about potential writing gigs, creative media consulting, my travel plans, or want to touch base for any other reason, feel free to shoot me an e-mail at katieboue (at) gmail (dot) com. Cheers! You got the hot tea with too much sugar from me. You should become the foremost expert on travel info for rock climbing enthusiasts. That’s lookin’ like the plan! Travel advice for people living the climbing lifestyle – traveling on a budget, exploring the outdoors, lots of locally-brewed beer, a heavy dose of different cultures, and of course loads of photography. Who wouldn’t love to write/read about that? Your site looks tight. You have writing talent. I get paid $10-$50 each blog story I write. It is a nice way to bring in extra money in todays economy. The company I write for has a couple openings if you enjoy writing as much as me.